Episcopal is also partnering with Baptist Health for 2018-2019. Baptist Health will provide four expert speaker panels for the Jacksonville community. Two events will take place during the fall semester and two will take place in the spring, addressing the following topics, respectively: Physical Health and Nutrition, Anxiety, Stress and Coping Skills, Influence & Effects of Social Media and Screen Time, High-Risk Behavior and Substance Abuse. Karla Repper, PhD, is a clinical psychologist with expertise in assessing and treating mental health conditions across the lifespan. She has specialized training in the assessment of emotional and behavioral functioning, cognitive development, and treatment of child and adolescent conditions. Dr. Repper follows a “scientist-practitioner” model, and utilizes therapies that research shows to be most effective. Cognitive behavioral therapy, interpersonal psychotherapy, exposure and response prevention, dialectical behavioral therapy, and parent training on behavioral interventions are some of her most-often used therapeutic methods. Anxiety disorders are among the most common mental health conditions affecting youth today. This forum will aim to identify the prevalence of anxiety among youth, red flags for when anxiety is shifting to an unhealthy level, and concrete strategies on how to effectively manage anxiety and promote brave behavior. Aubrey Brown, LCSW currently works in the Wolfson Children’s Hospital Partial Hospitalization Program (PHP). 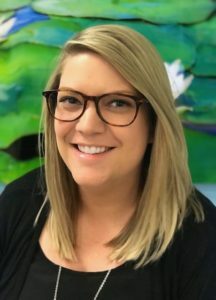 Aubrey has worked within the Baptist Health System for 10 years, and has previously worked in Adult Behavioral Health, Adult Neurosurgery, and in the Emergency Department. She started her career in behavioral health in 2008, after graduating from Florida State University with her Bachelor and Master degrees in Social Work. Aubrey has completed an intensive DBT training and continues to further her education in the treatment of adolescents. She has a particular interest in the prevention and treatment of chronic suicidality, self-injurious behaviors, and mood disorders. Aubrey is passionate about encouraging adolescents to talk about how they feel, what they think, and identify healthy ways to cope with life. 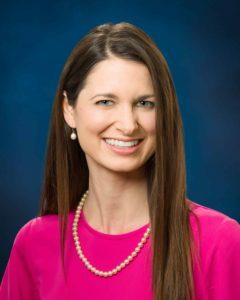 Dr. Stephanie Kinnare currently serves as a psychologist for Baptist Health at Wolfson Children’s Center for Behavioral Health. Dr. Kinnare specializes in working with children and adolescents, and treats a variety of psychological conditions, with particular emphasis on anxiety disorders, depressive disorders, grief/bereavement, coping with medical illness, and school-related stresses. Prior to her current role with Baptist Health, Dr. Kinnare served as clinical faculty and lead psychologist within the Division of Developmental Pediatrics for the University of Florida, College of Medicine, Jacksonville. There, she conducted psychological testing, supervised a counseling internship program, and consulted with school districts on classroom strategies for addressing mental health needs in students. She also served as a consultant for the Oklahoma Department of Education, helping Oklahoma school districts to pilot evidence-based interventions to address academic and behavioral needs of students. Dr. Kinnare received her B.A. in Psychology from Bucknell University and received both her M.S. and Ph.D. in School Psychology from Oklahoma State University.